Ronnie said he had more confidence with the epoxy and was not worried about potential devaluation because the phonograph would stay in his family for at least another generation. 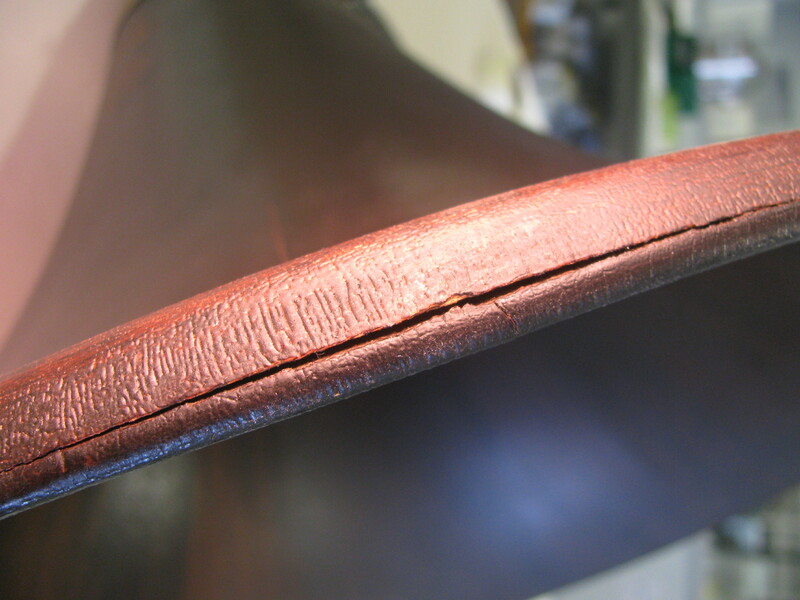 Crack in the edge of the wooden phonograph horn. I told him I would be happy to repair it in a very non-invasive way and if I did my job of repair well, he would not be able to tell that it had been repaired. I warmed the damaged section of the horn by placing a shop light close by for 15 minutes or so. I had to be careful because it is easy to damage the finish/patina on the surface of wooden antiques with just a bit too much heat. I mixed a small batch of G/flex 650 and transferred it into an 807 Plastic Syringe. I removed the heat source just before applying a bead of G/flex 650 Epoxy along the crack with the tip of the plastic syringe. Because the wood was warm (maybe 125°F) the epoxy thinned on contact and easily soaked into the cracked section. I applied epoxy multiple times over several minutes to fill any remaining voids in the joint. 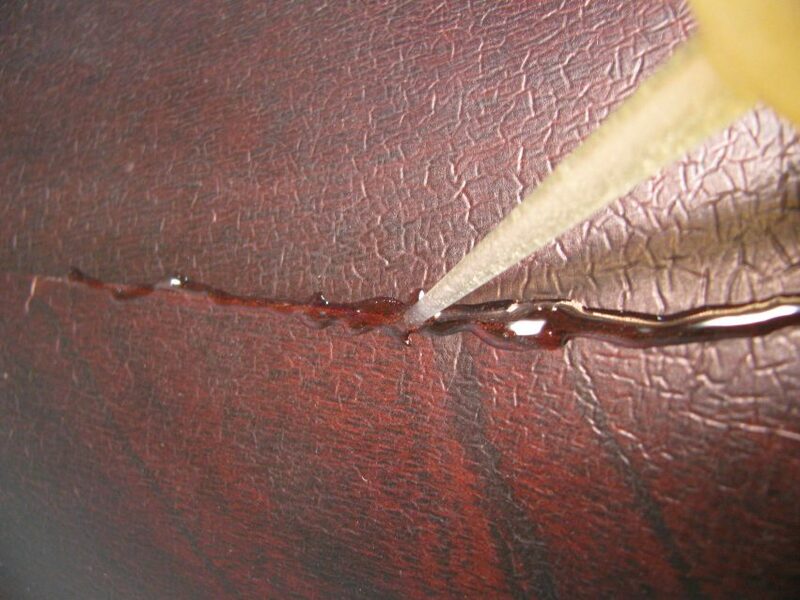 Epoxy applied to the crack through a syringe. 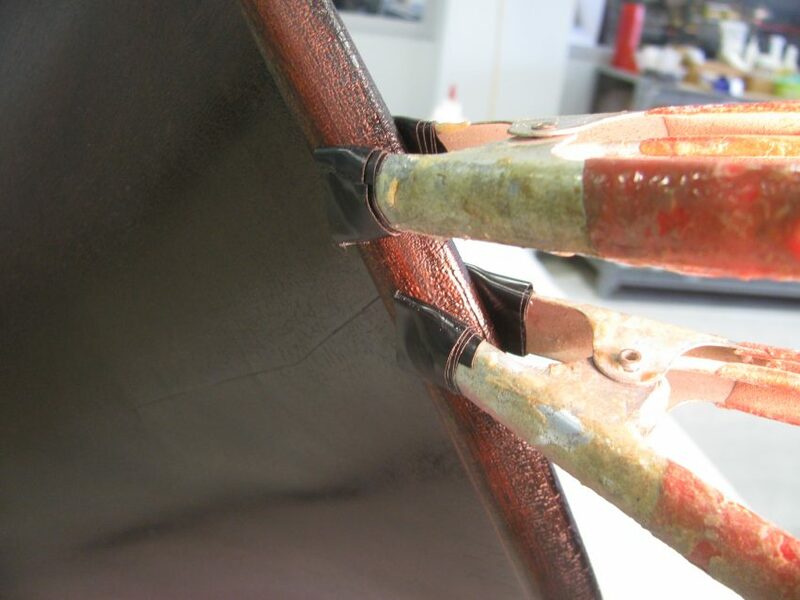 When the joint would not absorb any more epoxy, I clamped the area with spring clamps, allowed the excess to squeeze out, wiped off most of the excess with white paper towels and wiped off the last of the epoxy smears with dry cheesecloth. 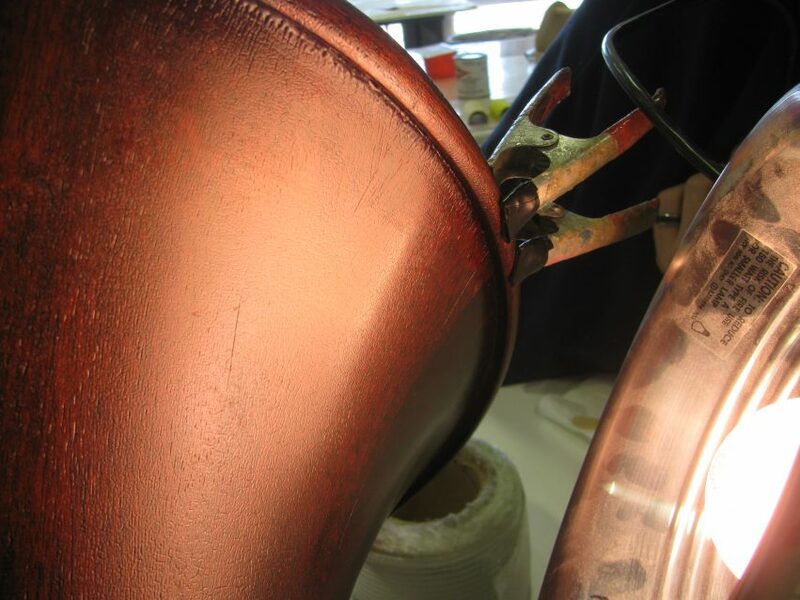 I wanted to avoid using any solvent for cleanup because these old finishes are easily damaged with solvent. I have used dry cheese cloth to remove the last slight smudges of uncured epoxy from the surrounding area many times before with excellent results. An old terrycloth towel will work just as well. 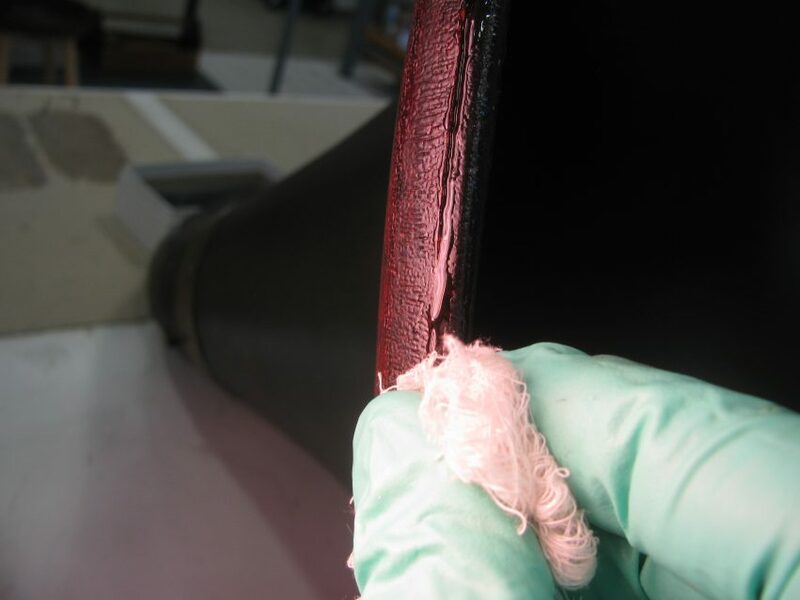 Removing excess epoxy smears with cheesecloth. I allowed the epoxy to cure overnight then applied a bit of Old English® furniture polish to the horn with cheese cloth. 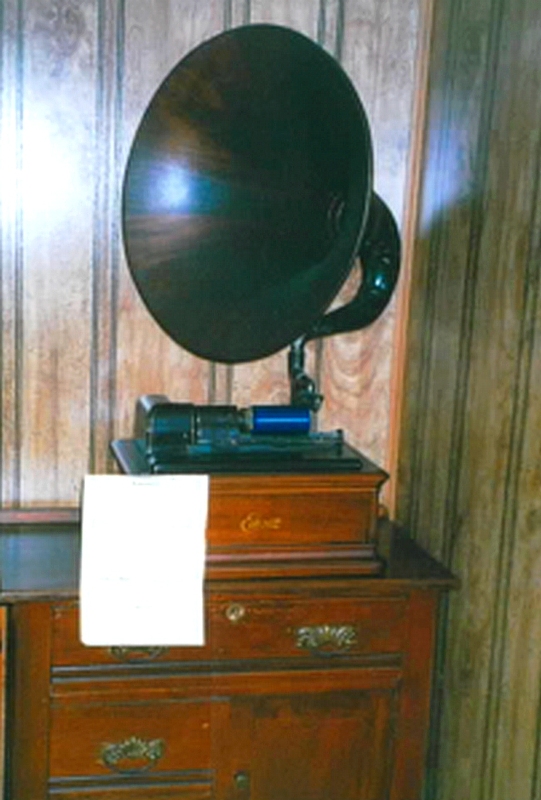 Repaired Edison phonograph with original bill of sale. I think from the photos you’ll agree that the repair came off fine. More importantly, Ronnie is happy. 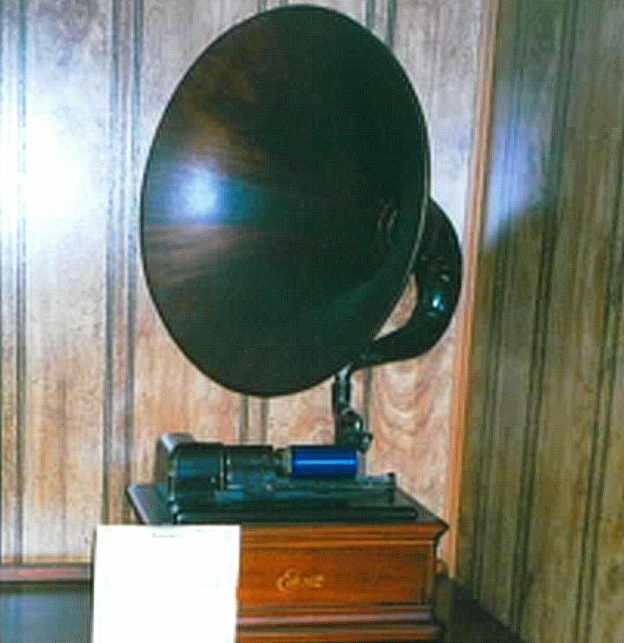 He sent this photo of the Edison with horn installed along with the original bill of sale from March 18, 1913.